In the late hours of Friday night, a high speed police chase left the suspect dead in the end. The suspect hit another vehicle and a tree before they came to rest. The accident happened on October 19, 2012, right before 12:00am. Police were chasing the suspect, whom they thought was armed after they had gained suspicion of the driver. The driver, whose name is undisclosed, was driving his SUV with several firearms inside, which were recovered after the accident. The driver was pronounced dead immediately. The people that were in the vehicle that was struck by the suspect during the chase were moderately injured and are being treated at the hospital for their injuries. They are in stable condition. The details of this case are still under investigation. Have you lost a loved one in a high speed accident? Have you been injured by another driver’s failure to go the speed limit? If so, call a Washington D.C. accident attorney for legal representation. They will build a case so that you can get compensated for any of your losses such as medical expenses, property damage, or funeral costs. 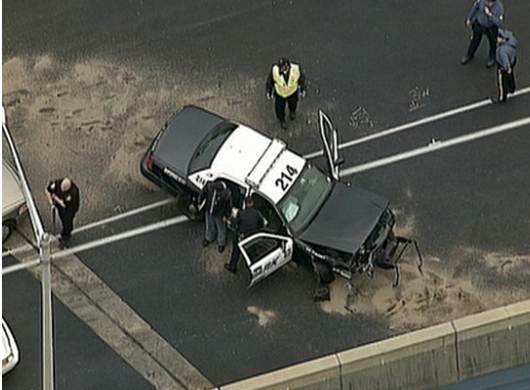 Previous Maryland Officer to Die in a Car Crash in Two Months.